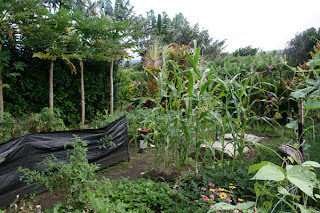 This post is all about the vegetable garden. I should have been posting more as the garden grew throughout the year but alas, time flew by and here we are in January and it's a mess! No where near ready for it's closeup. So here is a medley of images showing it in various stages...I've rotated the crops at least twice since the first planting in April of last year. These were picked just this week. I made a guacamole with the tomatoes and cilantro and onion and avocados from a friends yard. 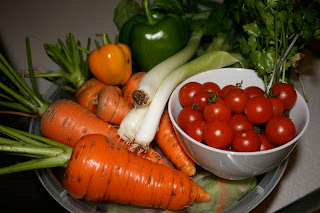 There are also carrots and a scallion and 2 peppers. Here's a shot of the garden from December. 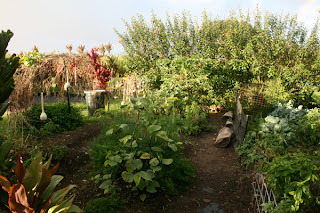 You can see the Kava, Dill, Carrots, Chamomille, Gourds (ipe) and parsley on the left. Basil, Tomatoes, Brussel Sprouts on the right. 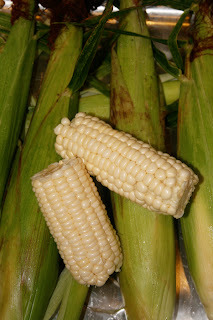 This shot is from October 20, showing the second crop of corn that I kept a close eye on. I sprayed it often, at night sometimes, with an organic bug repellent. The rose beetles devoured the first crop. And I think I had it in a somewhat shady spot so it got moldy. ick. But when I planted them more central in a sunny spot, they took off. Ok, so the yield wasn't bountiful, but it was enough for a meal or two. 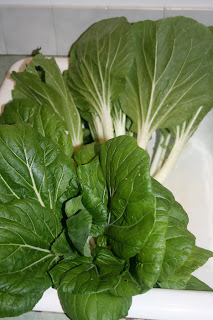 Bok Choy in our old sink so this must be from September. Delicious sauted in garlic and butter, them simmered in broth until tender. 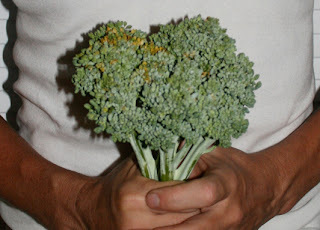 This was our first head of broccoli, from August I think. It seemed like a miracle for I had given up hope on the broccoli. I was losing the battle against the green caterpillar. 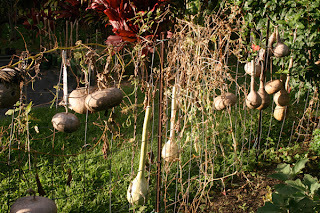 Gourds, or ipe in Hawaiian, drying in the winter sun. These are one of the dozen or so plants brought over by the early polynesian settlers, also known collectively as "canoe plants." Other garden growers include beans and peas, strawberries (in season now) eggplant, arugula, red lettuce, green lettuce, red onions, chinese celery, and swiss chard.